Here are some little bottles that I had sitting around. 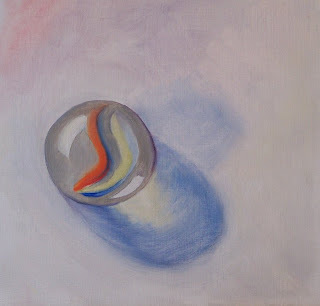 I thought it would be fun to work with the reflections, the light shapes, and the translucency. 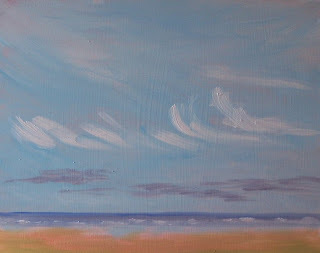 This painting is based on a photo I took last summer on the Pacific coast. I'm longing for some warm weather and sunshine. How about you? 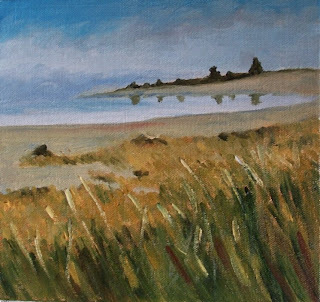 This little painting is based on a photo I took last summer near Damon Point State Park on the north side of Gray's Harbor on the Washington State coastline. 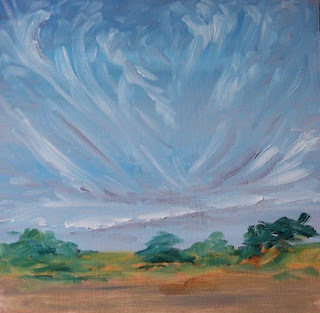 The sky looked like it was going to let loose with something strange, but it never did--just an odd cloud formation. 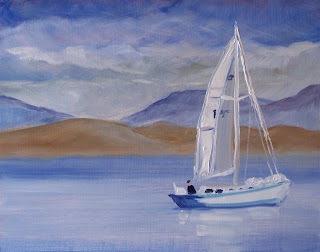 I love to see the brave souls who sail when the temperature is cold. This is from a photo I took of just such a man. This is Damon Point on the north side of Gray's Harbor on the Pacific Coast of Washington State. 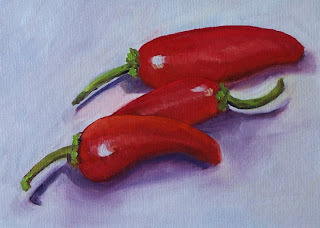 I had so much fun with the last painting, I had to do another of those wonderful little peppers. 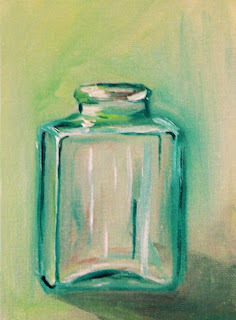 This little gem was fun to paint. I love red! 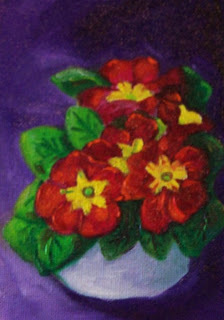 This painting has been SOLD. Spent the weekend on the coast. It was wet and rainy, but the beach still shared its beauty. 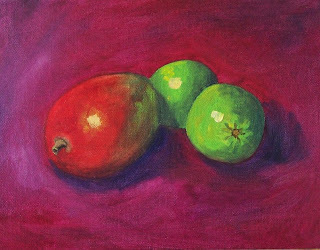 Mango and limes--second in the tropical fruit series. I love the colors of tropical fruit. 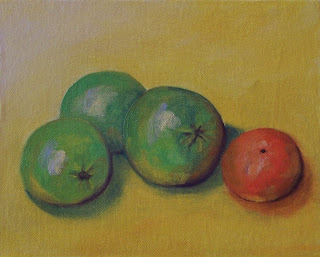 Today's effort combines limes and a tangerine on a sunny yellow background. 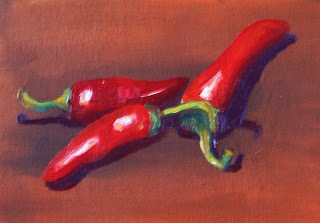 It was very fun to paint. I hope you enjoy looking. 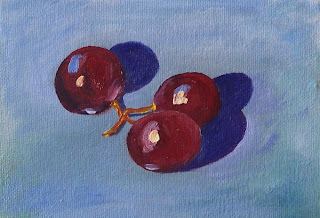 A little sprig of grapes--fresh and juicy--sitting on a sunny kitchen counter inspired this crisp little still life. 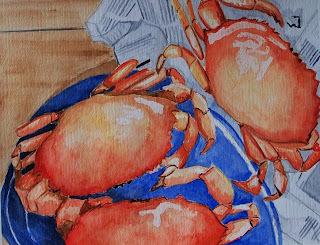 I haven't completed a watercolor in a very long time, but I developed a lust for fresh crab today and watercolor captured the image well. 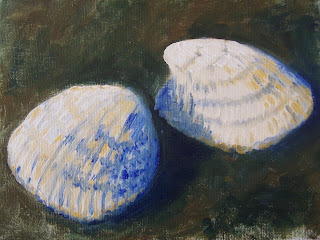 For many years I lived on Hood Canal in Puget Sound and was used to fresh crab whenever I wanted it. Three years ago I moved away. Needless to say I miss summer days and eating fresh cracked crab over a newspaper with a pair of pliers. 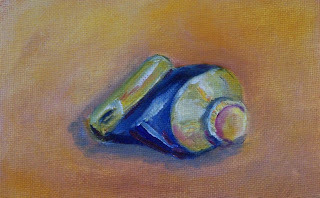 Today's posting is a tiny still life of one of my paint tubes. 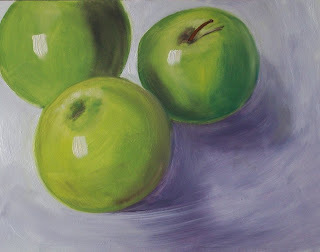 It was completed quickly in the late afternoon before I lost the daylight. 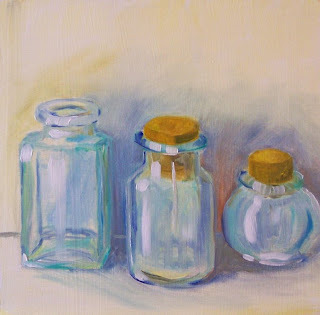 I prefer to paint in natural light, so my painting time is often restricted in winter. 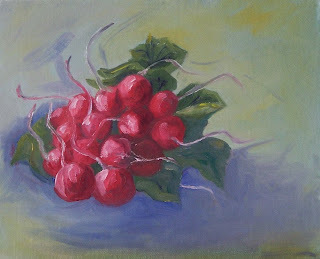 I'm looking forward to longer days, more day light, and more time to paint. 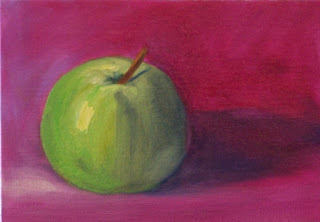 I had some left over paint from yesterday, so I painted this Granny Smith apple. I hope you enjoy looking. Saturday morning grocery shopping always brings with it the bright colors of fresh produce. 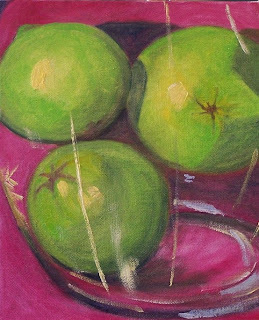 I couldn't resist these limes; I wanted to make sure I could see their beautiful color so I put them in a glass vase. This was a delightful Saturday morning project.